EPIC’s repellents are highly and almost immediately effective. The repelling granules do not harm, poison or kill the target animals. Rather they change the animal’s environment by causing the surroundings to smell bad to them, inspiring fear and/or avoidance. When family dogs can run free throughout a yard they often can cause unsightly damage. Digging can destroy beds and landscaping. Urine spots and other messes can make even large yards unpleasant to use for children and other family members. Even where leash laws are in effect, your curbside, lawn and decorative plantings can be soiled and even ruined by dogs on leashes doing their business or marking their territory. Now it's possible to protect your lawn and curbside from unwanted brown spots and other messes. Train your dog to stop digging in the wrong places. Teach your pet to use designated areas for relieving himself, and to avoid yards and beds reserved for your family and favorite plants. Stop dogs on leashes from doing their business on your property! 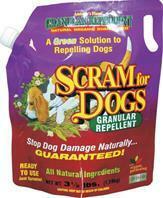 Scram for Dogs™ stops dogs in their tracks and trains them to stay away. • Safe and organic, humane for dogs. • Protects plants and lawn year-round from urine stains. • No more cleaning up messes in areas that you don't want to! • Additional benefit for clients means additional revenue for you. DOG SCRAM is organic and environmentally-friendly, is effective for extended periods and is safe for pets, animals and children. DOG SCRAM comes in a dry, granular form. It works by repelling dogs from areas where they are not wanted. We can not smell DOG SCRAM, and it does not harm dogs. Before applying, turn bag upside down and shake the closed bag vigorously. Apply by shaking granules in and around the area to be protected. Once repelling action is well established, reapply every two or three weeks. Reapply after heavy rains. • 3.5 lb. Shaker Bag (Covers 2,100 square feet).